Hello, my friends! How are you feeling today? 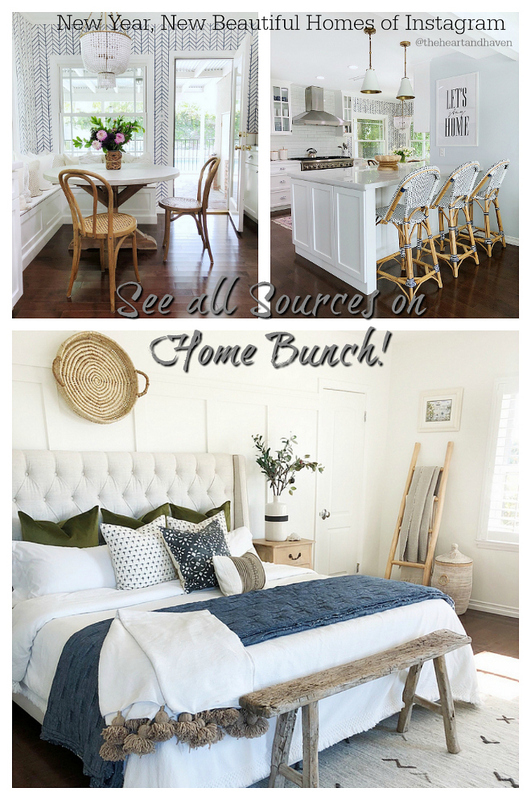 I hope you’re feeling good, in good health, and are able to take a few minutes to enjoy this house tour I have prepared for you. 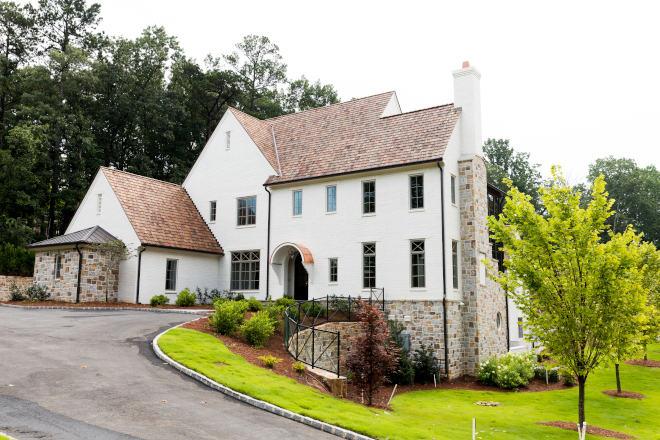 It’s truly a pleasure to share such a beautiful home! 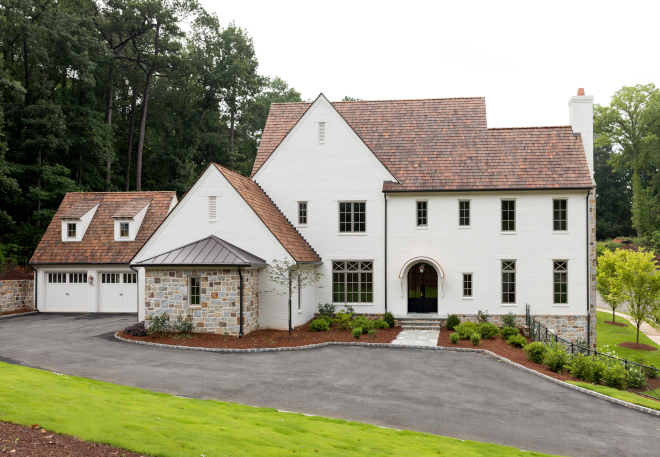 Recently built by Macallan Custom Homes, designed by TS Adams Studio Architects (also featured here, here, here & here – yes, I do love their work! 🙂 ), and with interiors by Tyler Colgan, this Modern English Farmhouse comes to detox our minds of cluttered spaces, and I don’t say that only because this home was just completed and it’s still unfurnished, but mostly because its empty spaces will allow you to imagine how you could decorate it and, most importantly, it will allow you to notice the architectural details in a way that you might not have had if this home was already furnished. 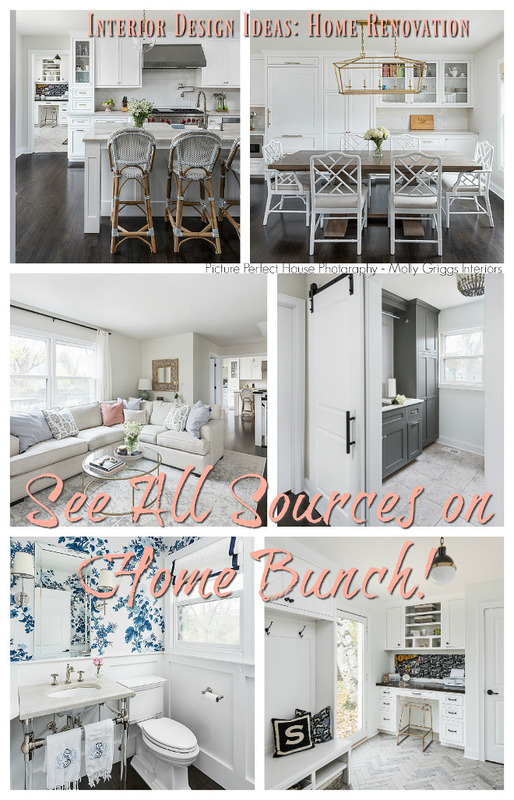 Take notes on the sources shared such as paint colors, lighting, countertops and notice the inspiring kitchen and bathrooms details. I hope you have a really good time! What a curb-appeal! 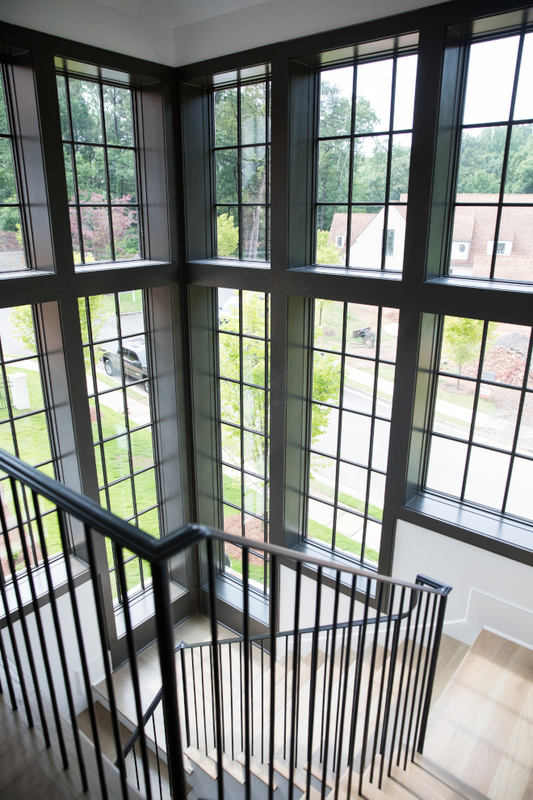 A beautiful custom iron railing adds an elegant touch to this classic home. 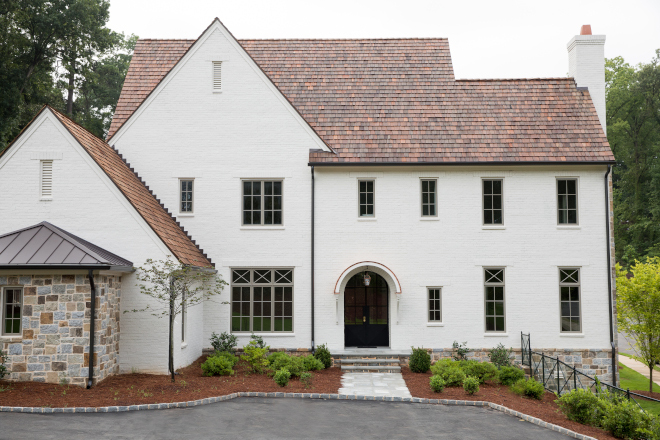 It’s impossible to not be impressed by this timeless home. If not ready to commit with black windows, grey is a color that is current but still subtle. 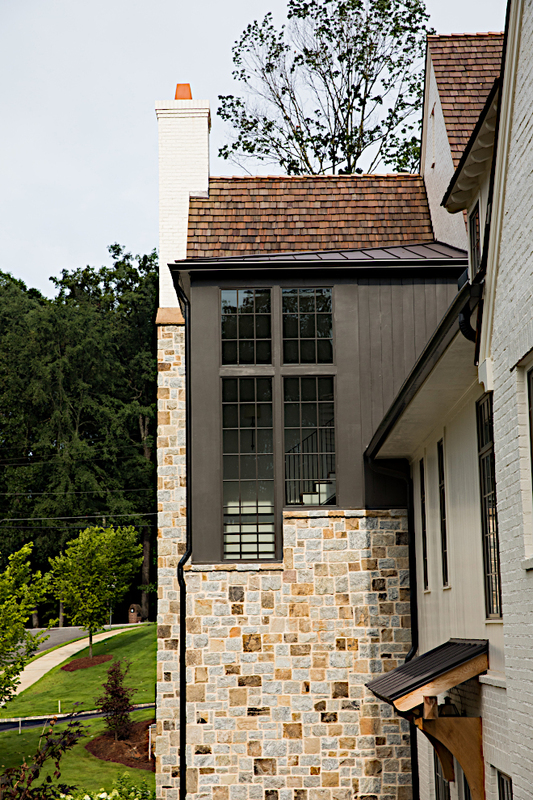 These grey windows were painted in Mindful gray SW 7016 by Sherwin Williams. 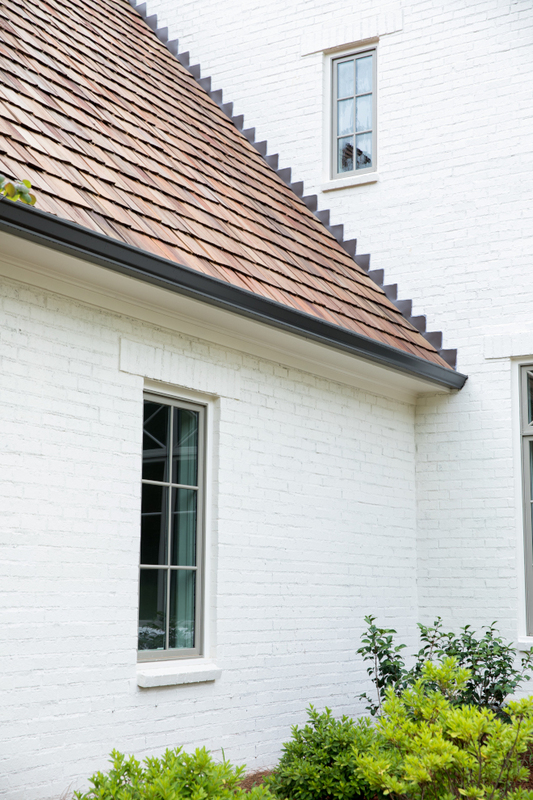 Off-White Exterior Brick Paint Color: Benjamin Moore Soft Chamois. 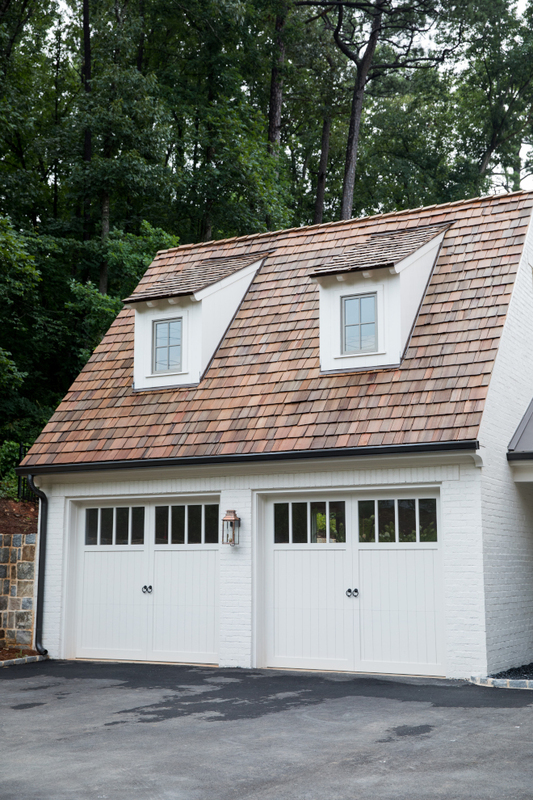 This two-car detached garage exudes charm with its classic architectural details. 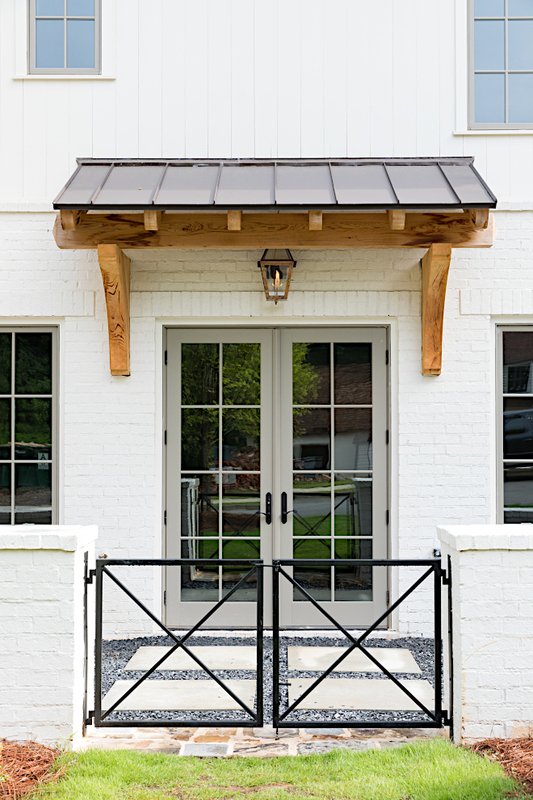 Garage Door Hardware: here & here – similar. Copper Sconces: Coppersmith – similar here. 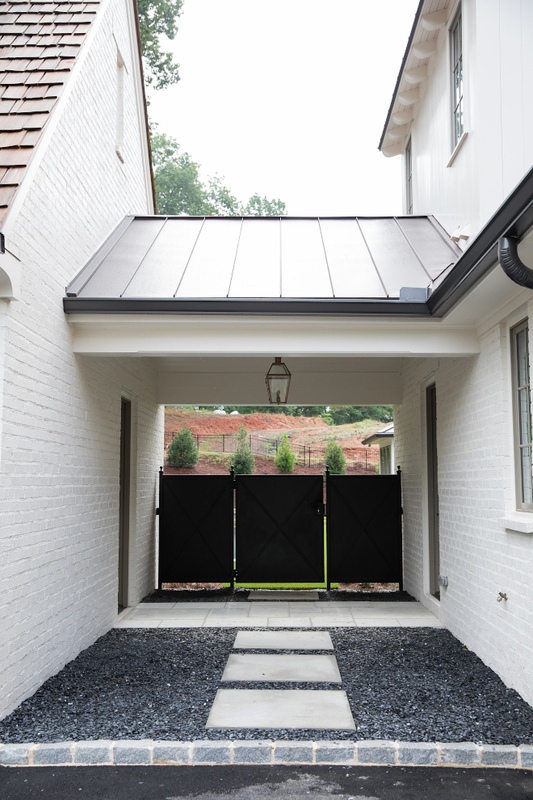 Custom iron gates create a sense of privacy and safety to the backyard while allowing easy access to the back of the house. 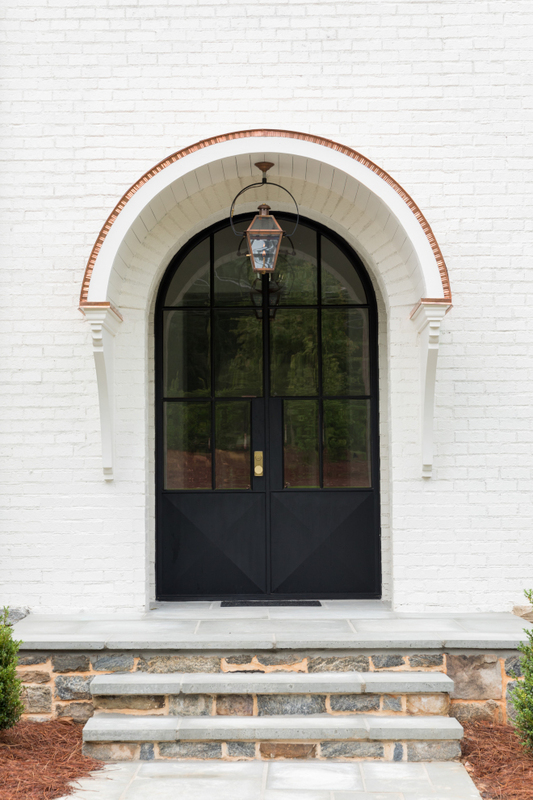 This arched black metal and glass front door is a show-stopper! Notice the copper awning and the beautiful arch detail. 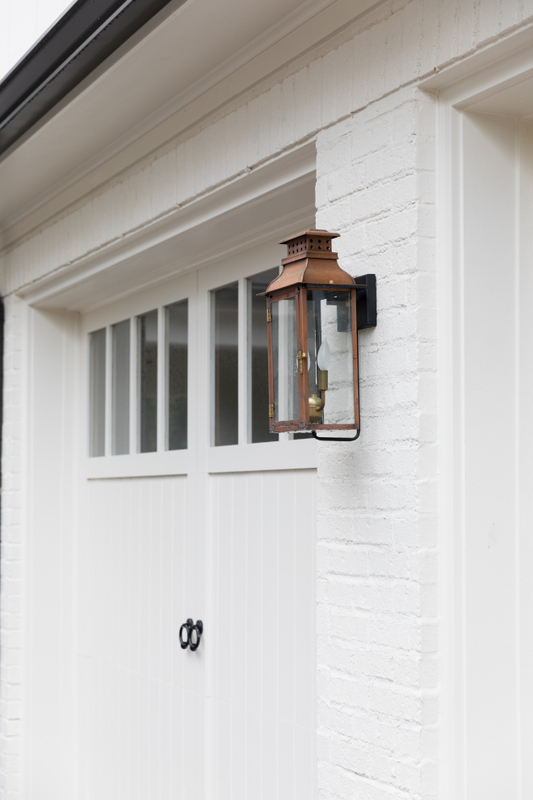 Outdoor Lighting: Coppersmith – similar here. 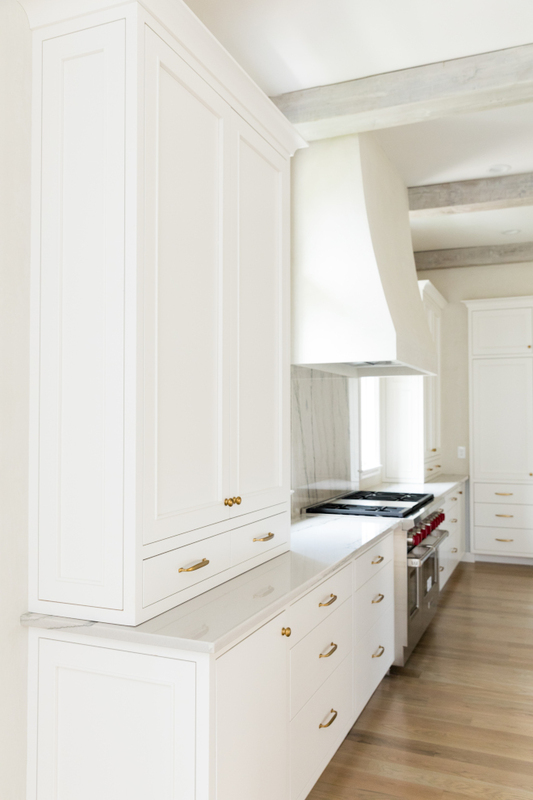 I always feel excited when I see a well-designed space and this kitchen feels perfectly balanced. It’s functional without feeling overly done. Kitchen Lighting (installed after photos were taken): Visual Comfort in Bronze. 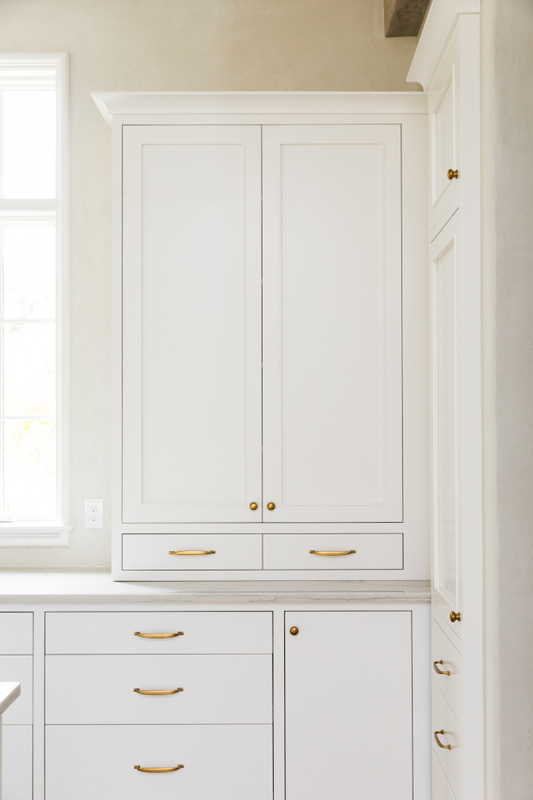 Cabinet paint color is Sherwin Williams SW 7004 Snowbound. 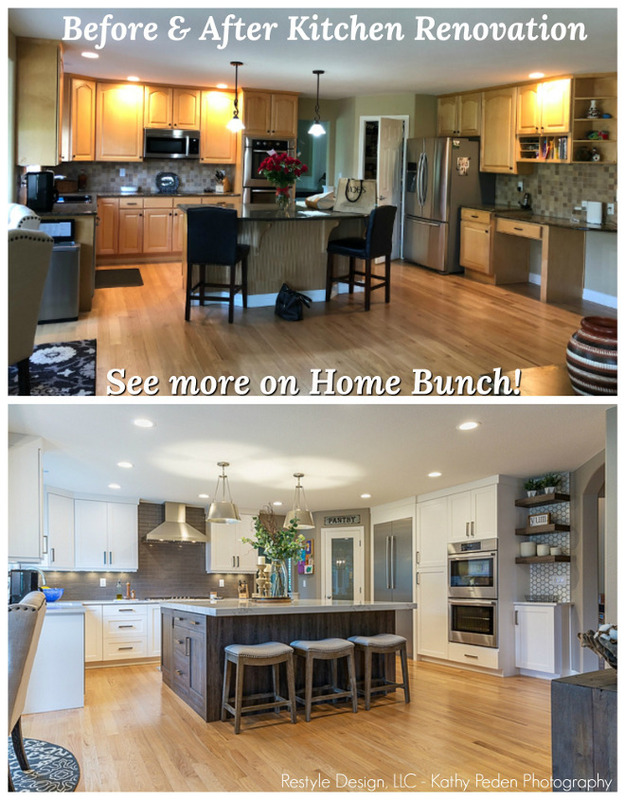 Kitchen Hardware: RH – similar Pulls & Knobs. 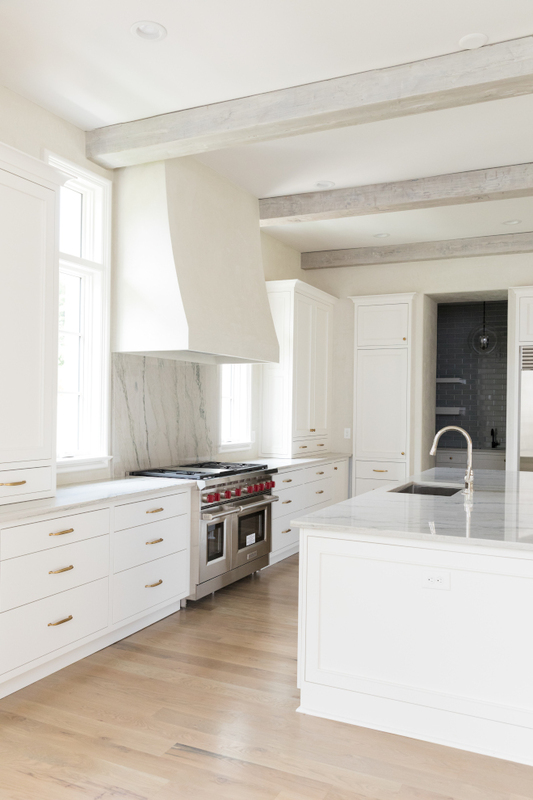 The countertop and backsplash (behind the range) is polished Antique White Marble. 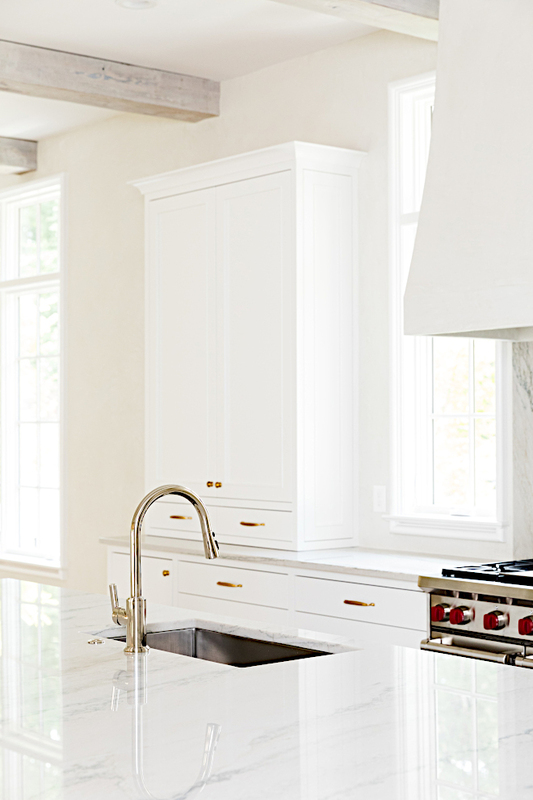 Kitchen Faucet is Kallista Vir Stil Minimal Pull-Down Faucet. 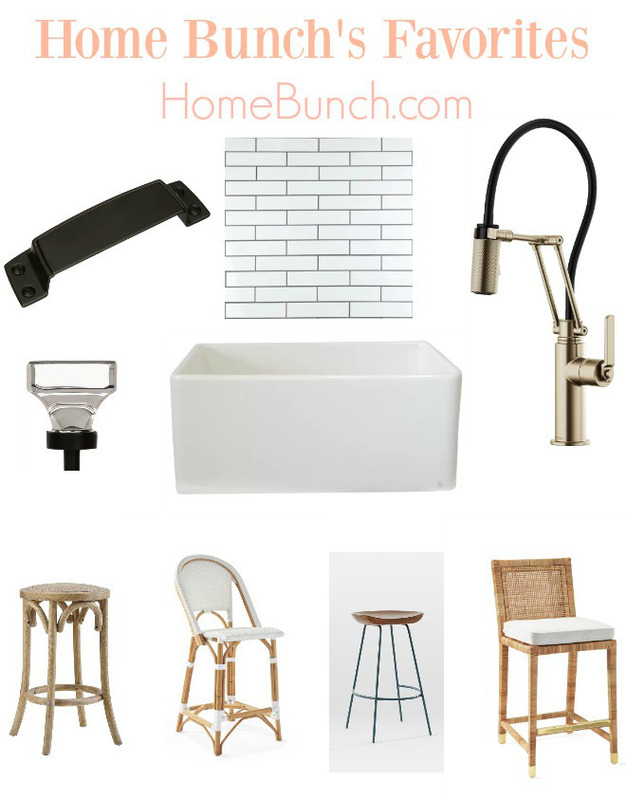 Other Affordable Options: here, here, here, here & here (sink & faucet set). 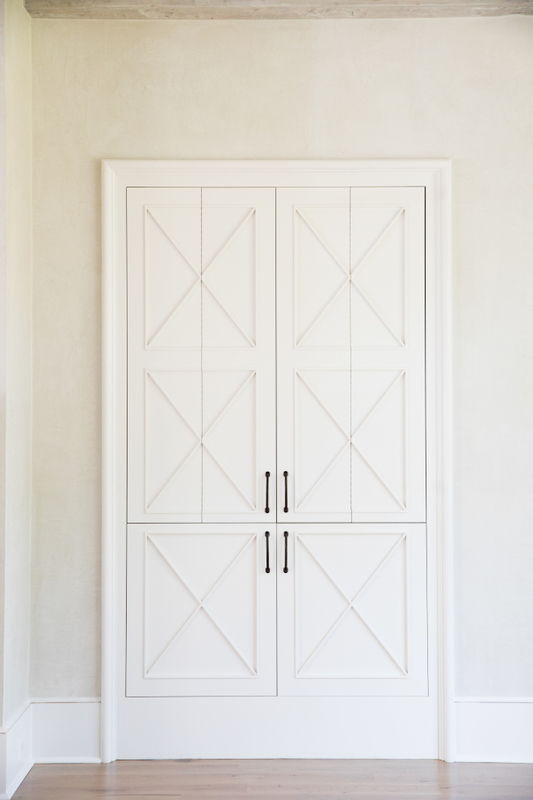 Kitchen cabinets are custom with inset flat paneled doors. 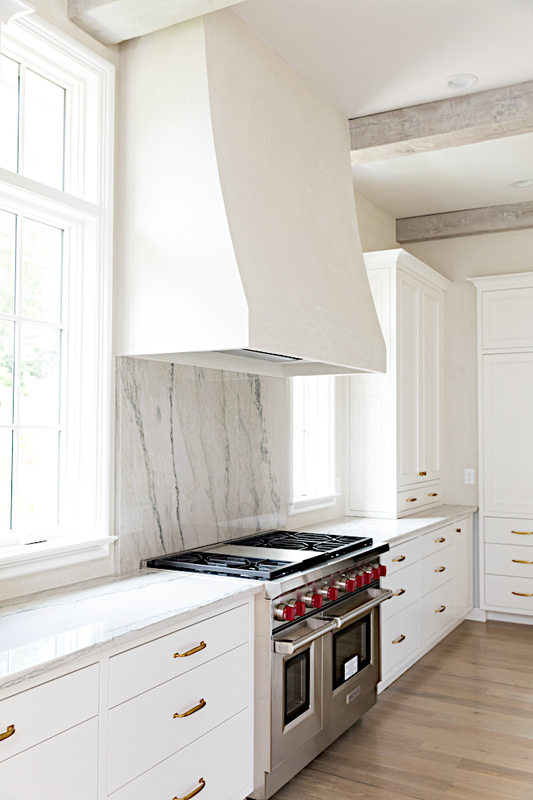 The kitchen also features a custom hood with a Venetian plaster finish. The kitchen leads to a walk-in pantry. 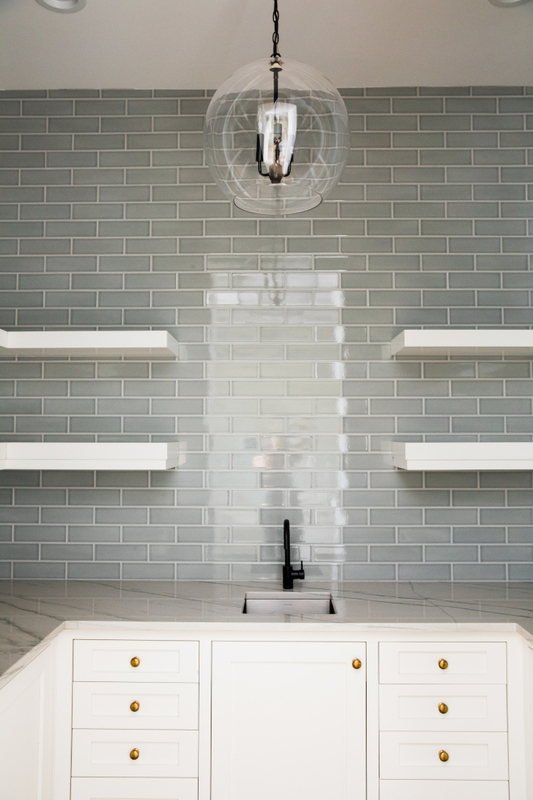 The working pantry features a grey subway tile backsplash, white cabinets, brass knobs and floating shelves. Backsplash Tile: 3×9 Villa Heirloom Aqua tile – Other Beautiful Backsplash Tiles: here, here, here, here, here, here, here, here, here & here. 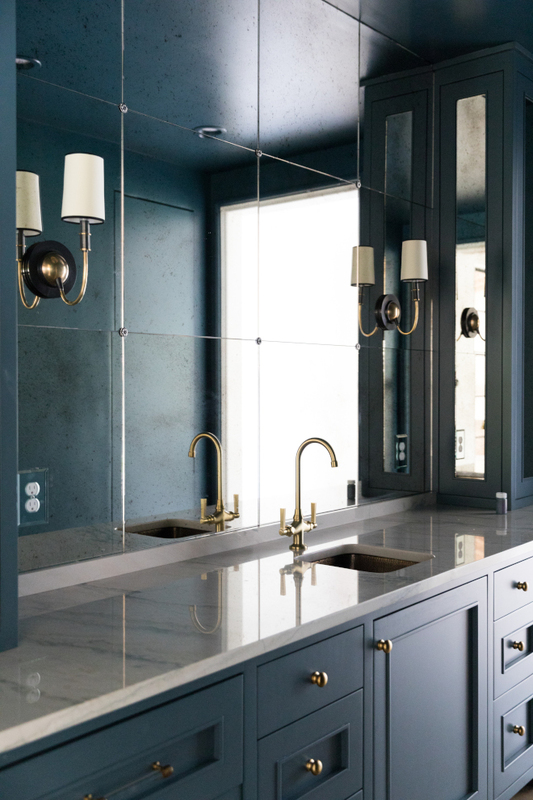 Faucet: Newport Brass in Matte Black. Lighting: Feiss – Others: here, here, here, here & here. 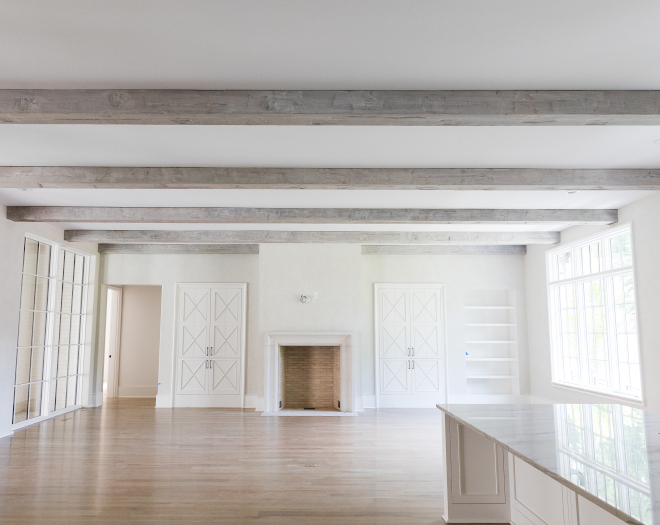 The kitchen, dining area and the Great Room features distressed box beams with a custom whitewash finish. 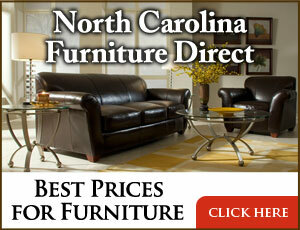 Flooring is 5” White Oak floors – similar here & here. 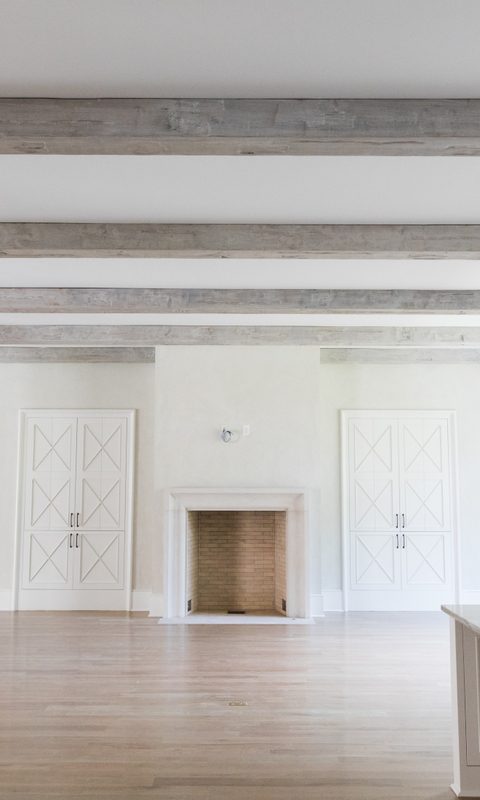 Custom cabinets with “X” inset and retractable doors flank a Limestone fireplace. Cabinet Pulls: RH – similar 6″ Pulls. 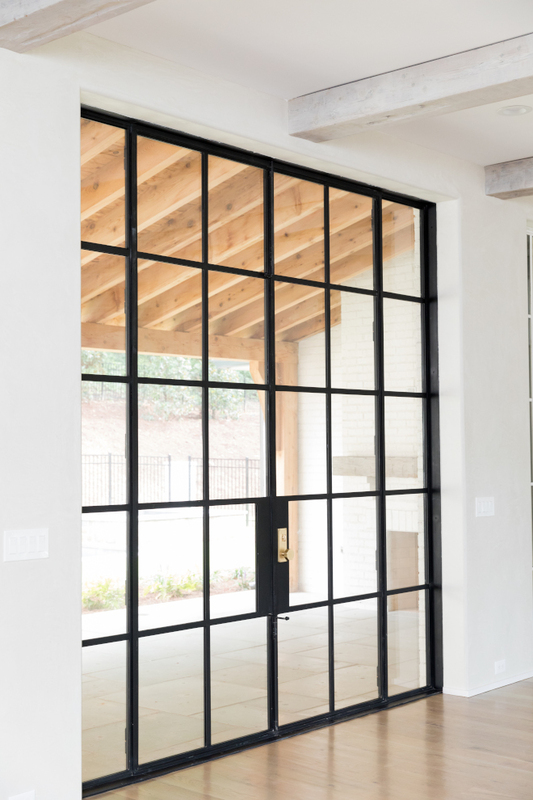 Black steel patio doors lead to the back porch. 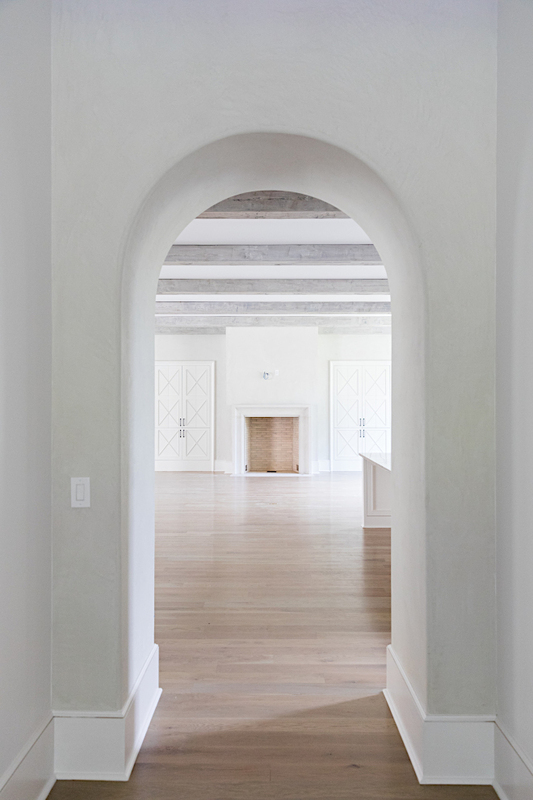 The walls have a custom Venetian Plaster finish. 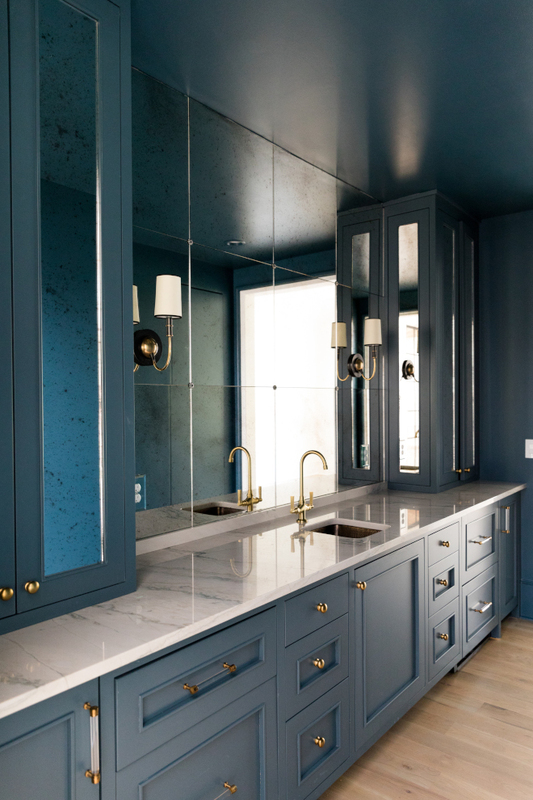 The butler’s pantry features deep green/teal cabinets and ceiling. 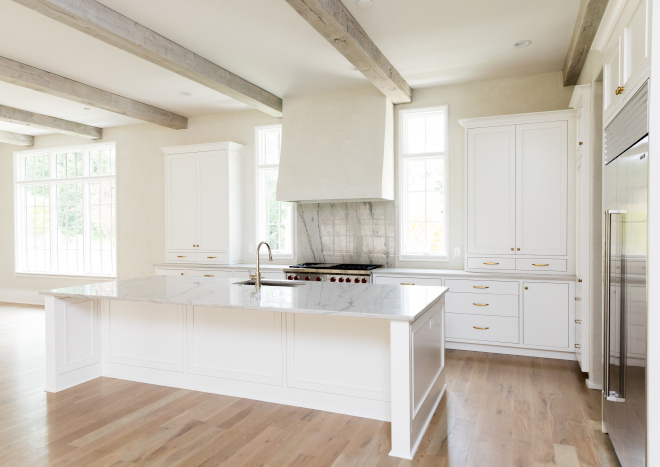 White marble countertop and White Oak hardwood flooring add a subtle contrast to this dramatic space. 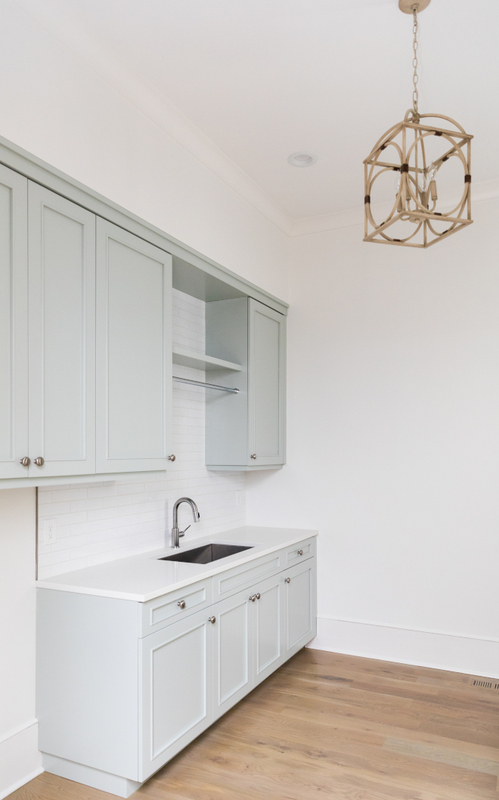 Cabinet paint color is Newburg Green HC-158 by Benjamin Moore in Eggshell. 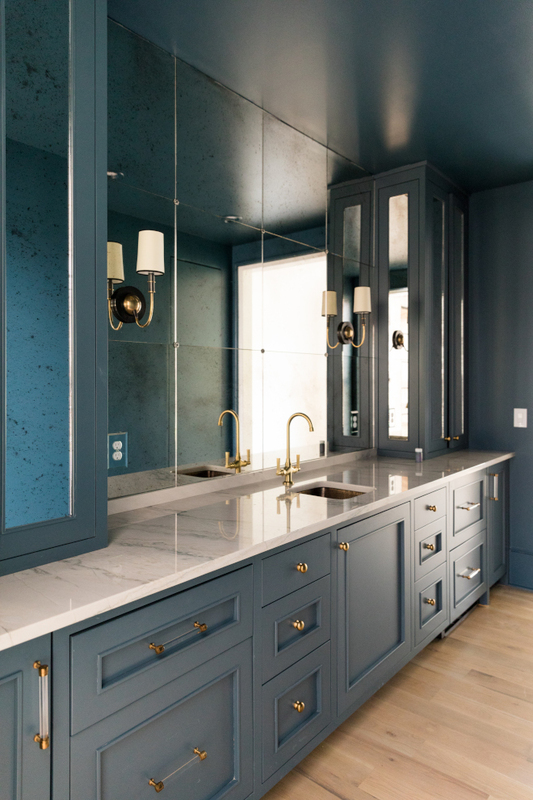 Butler’s Pantry also features Antique White counters and an antique mirror backsplash. Beautiful Mirrored Tiles: here & here. Cabinet paint color is Worldly Gray SW 7043 by Sherwin-Williams. Countertop is Black Honed Stone. 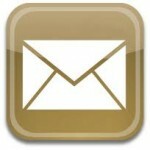 Faucet: Phylrich – Others: here, here & here. 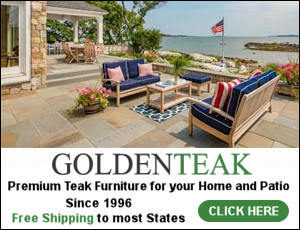 Cabinet Hardware: Satin Brass tab finger drawer – similar here & here. 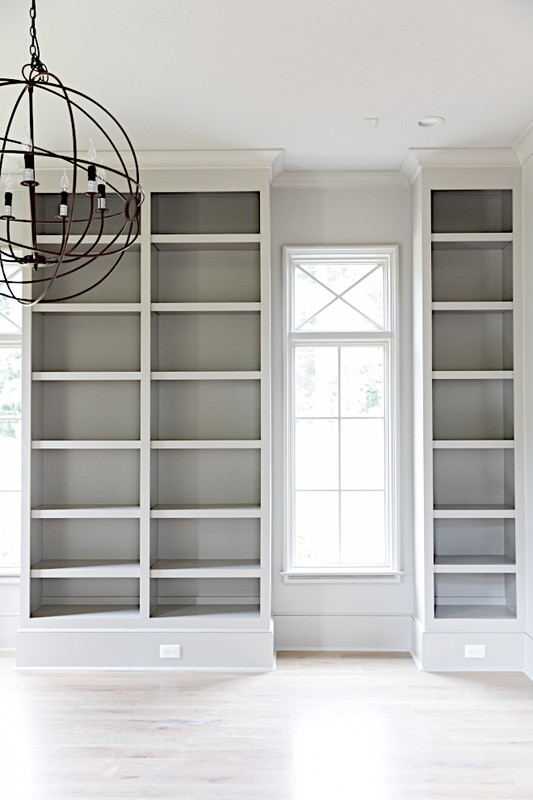 Grey Study Paint Color: Mindful Gray SW 7016 by Sherwin-Williams. Walls are in eggshell and trim and windows are in semi-gloss. 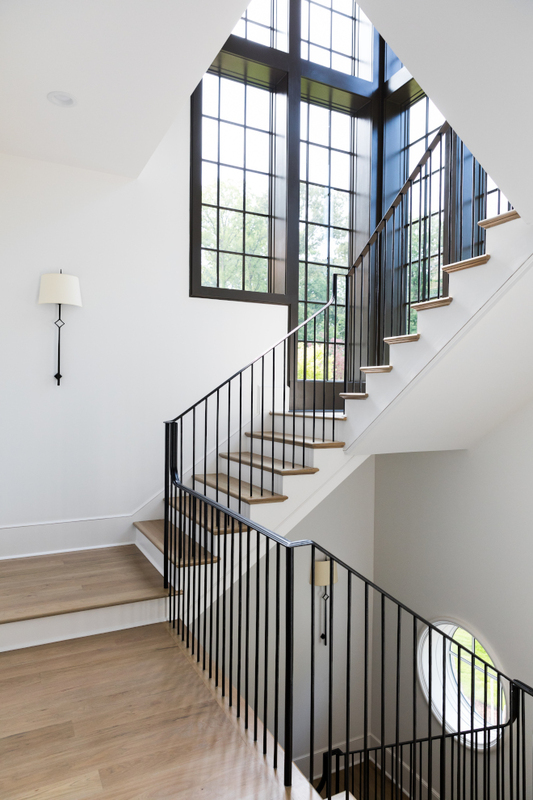 The stunning staircase features custom metal railings and spindles, hardwood threads and black steel windows. Sconces: Visual Comfort – Other Beautiful Sconces: here, here, here, here, here, here, here & here. Windows are Sierra Pacific provided by LiteWorks. 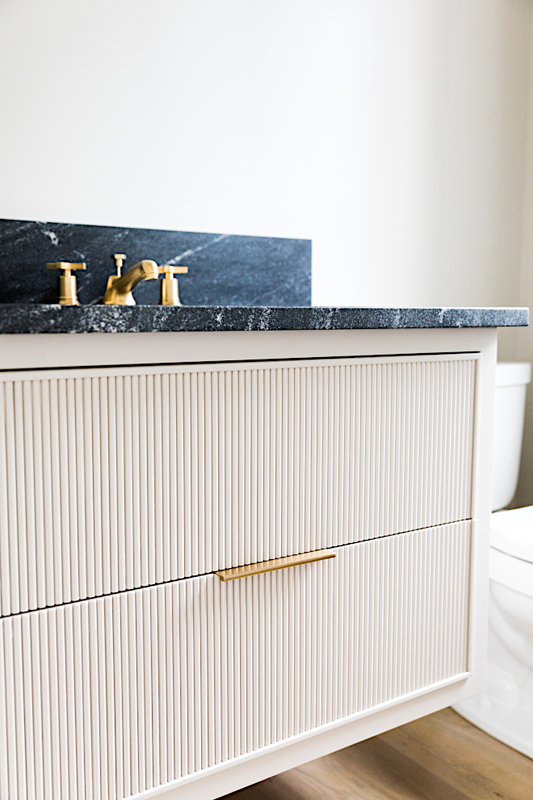 The master bathroom feels serene and elegant. Walls are Sherwin Williams Snowbound. Similar Lighting: here, here, here & here. Floor Tile: Walker Zanger Bianco Bello 12×24 Honed – similar here. Blue Gray Paint Color: “Benjamin Moore Nimbus Gray“. 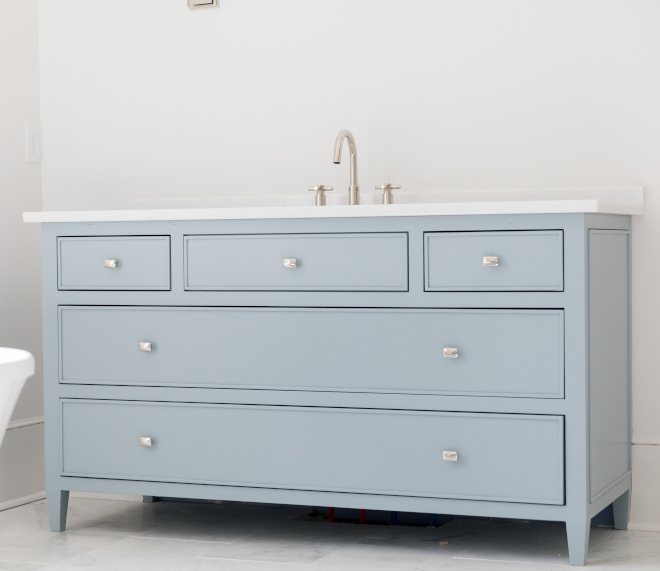 Vanities are custom – Other Beautiful Vanities: here, here, here & here. 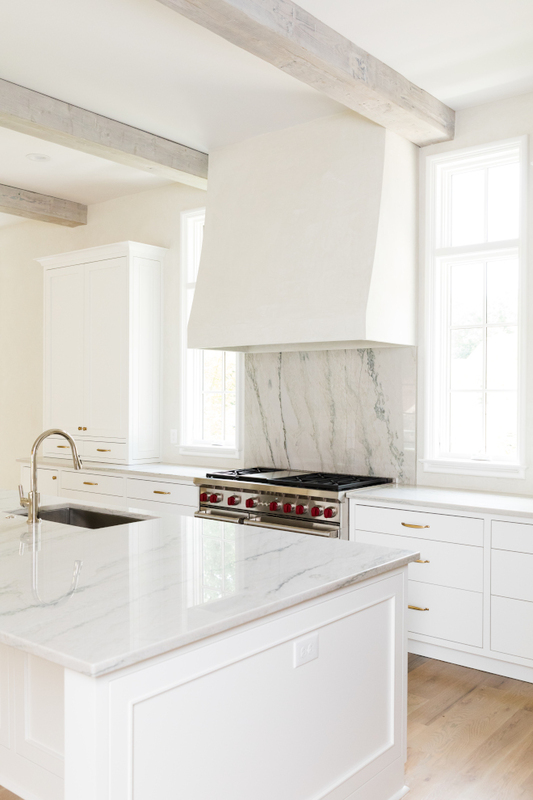 Countertop is Premium White Marble. Faucet is Phylrich Basic Double Handle Widespread Lavatory Faucet – similar here. Knobs: RH – similar here. 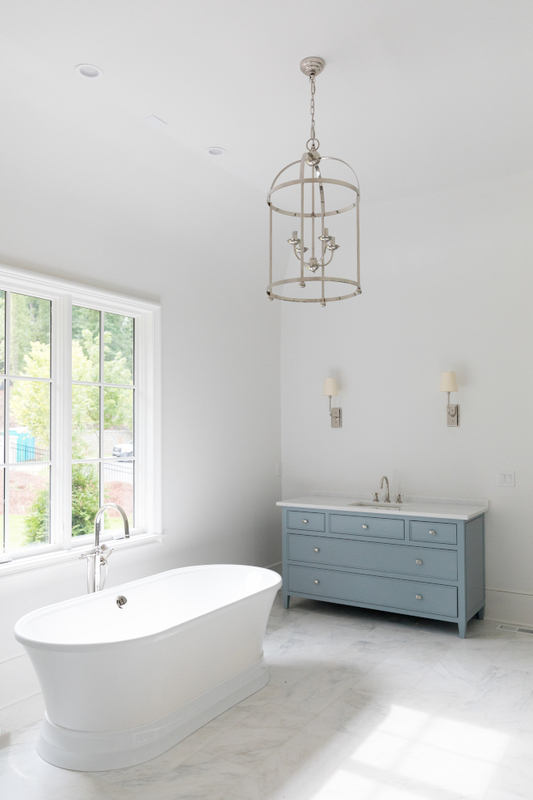 Shower Walls: Walker Zanger Bianco Bello 12×24 Honed – similar here. Shower Floor: Walker Zanger Bianco Bello Mosaic – similar here. 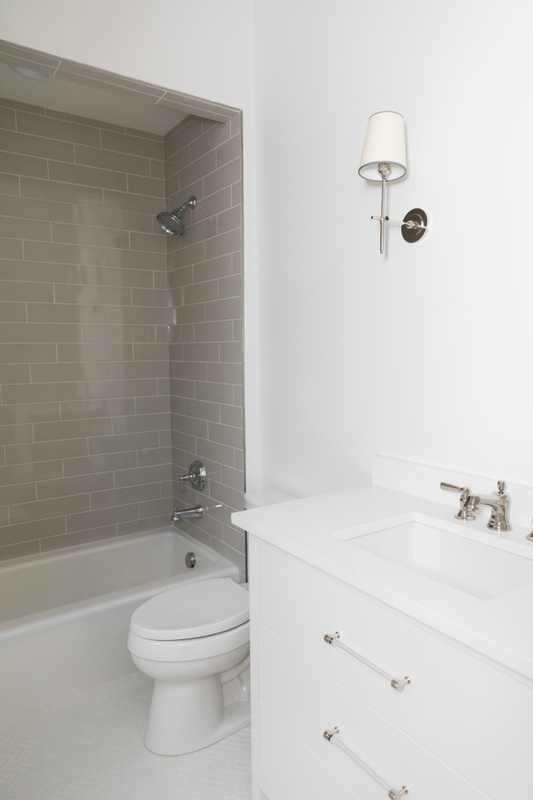 Shower Walls: 4×16 Metro Gray Ceramic – similar: here, here, here, here & here. 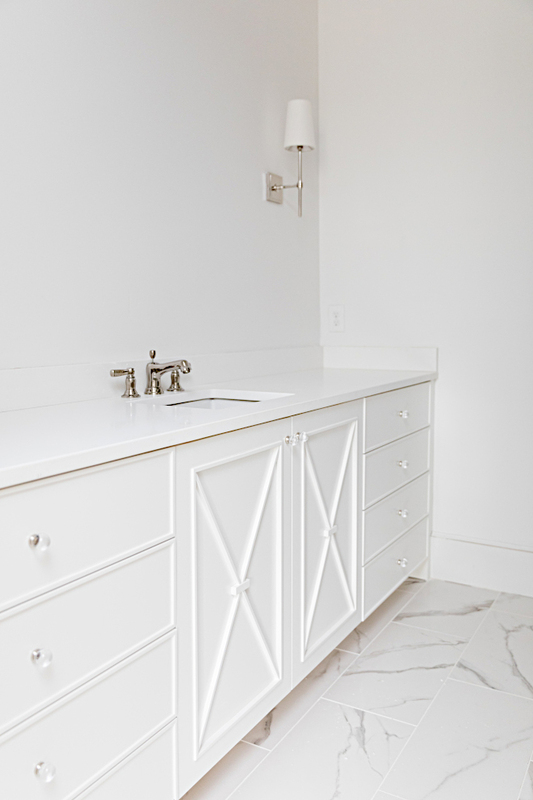 Vanity is custom with White Mist quartz countertop. Hardware: RH – similar 8″ acrylic cabinet pull. 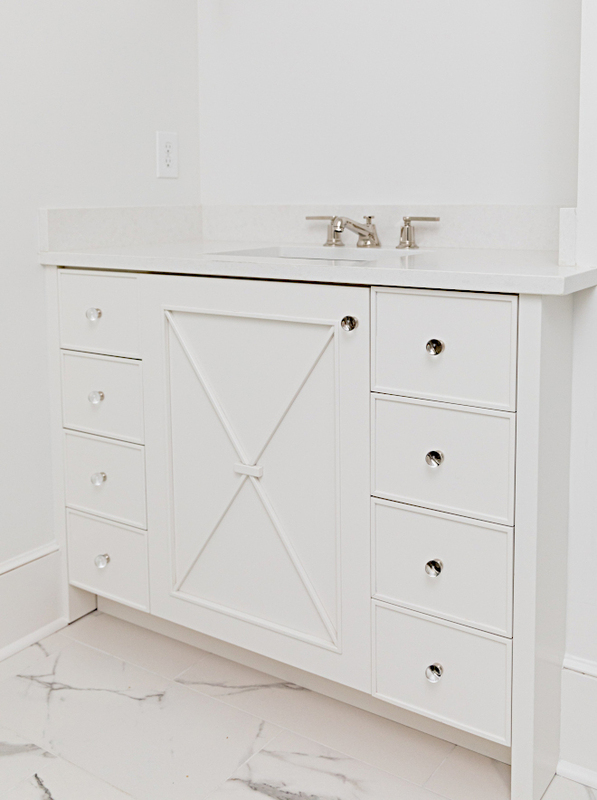 This guest bathroom features a custom vanity with a “X” detail. 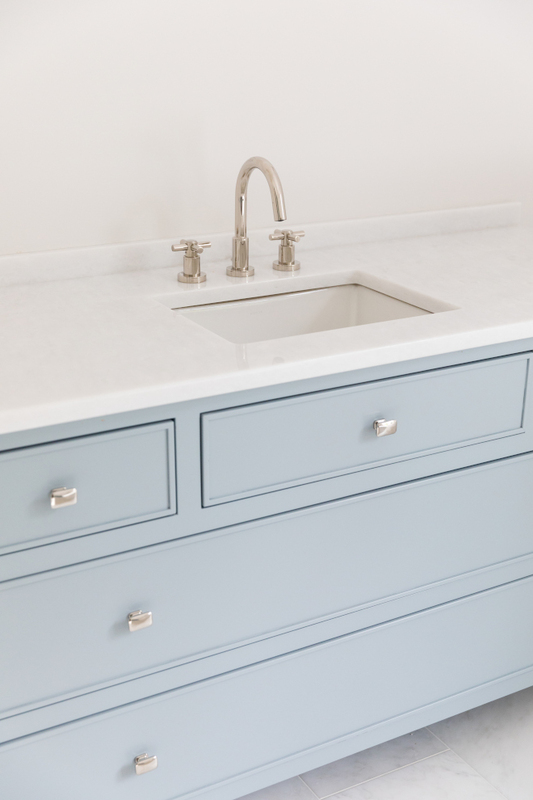 Countertop is also White Mist quartz. Knobs: RH – similar Knobs. 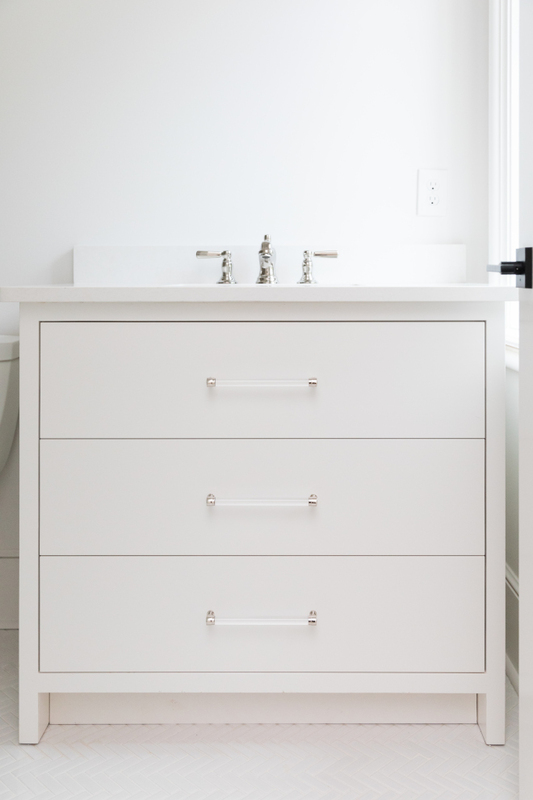 Bathroom cabinetry is inset flat paneled slabs. Paint color is Sherwin Williams SW 7004. 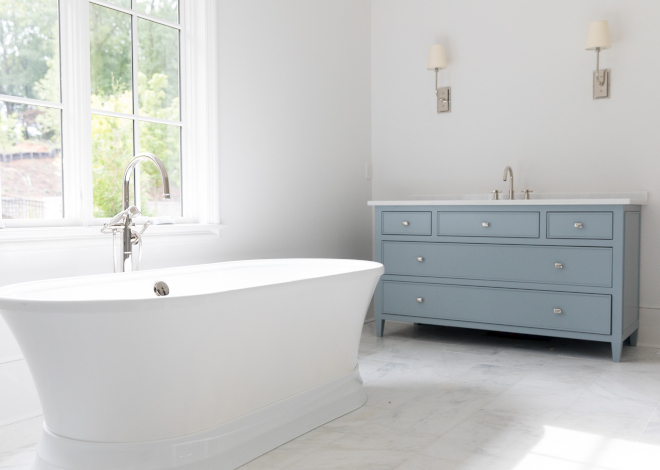 Bath Floors: Walker Zanger 12×24 – similar here. Knobs: RH – similar Glass Knobs. This laundry room is very spacious and yes, flooring is hardwood! Cabinet paint color is “Benjamin Moore Silver Marlin”. Lighting: Here – Other Beautiful Pendants: here, here, here, here, here, here, here, here & here. 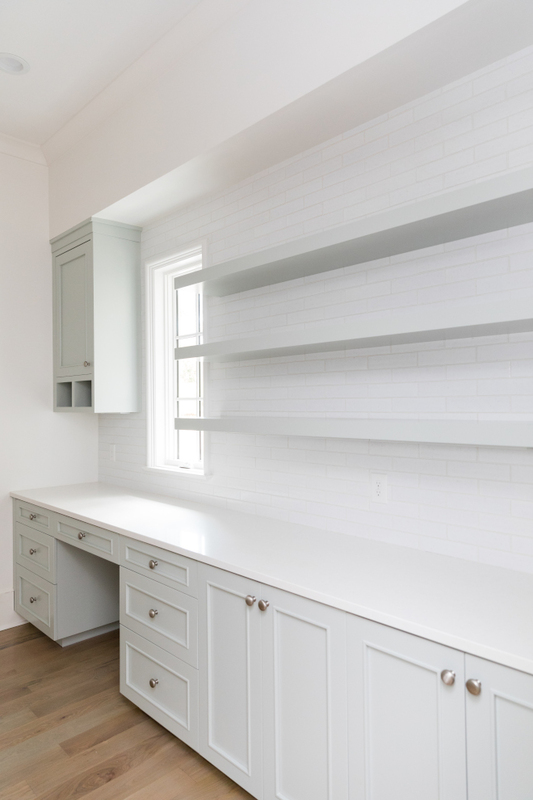 The other side of the laundry room features more cabinets, a desk area and open shelves. This space is perfect to be used as a craft room or sewing room. 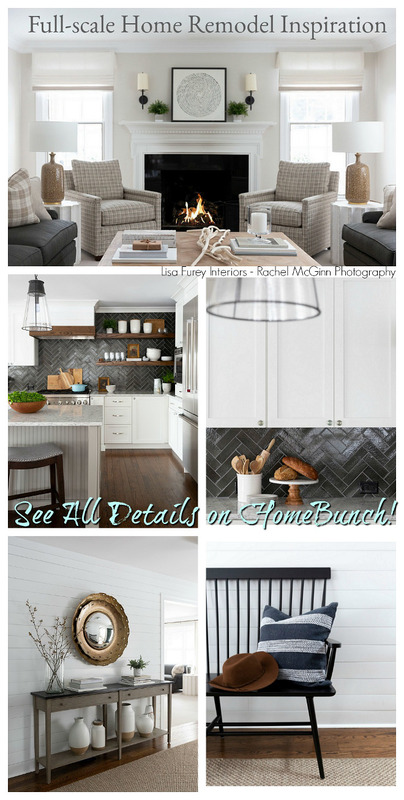 Backsplash: 2×9 White Brick tile backsplash. 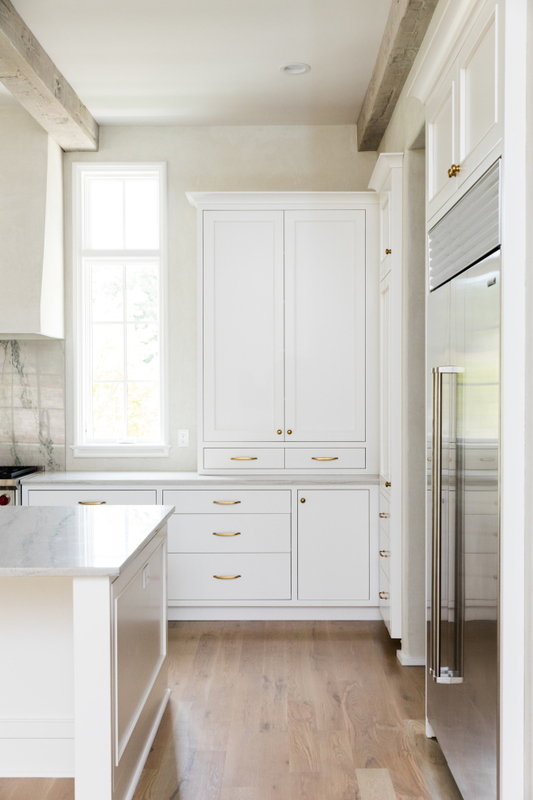 Cabinet Pulls: RH – Satin Nickel Mushroom Knobs. 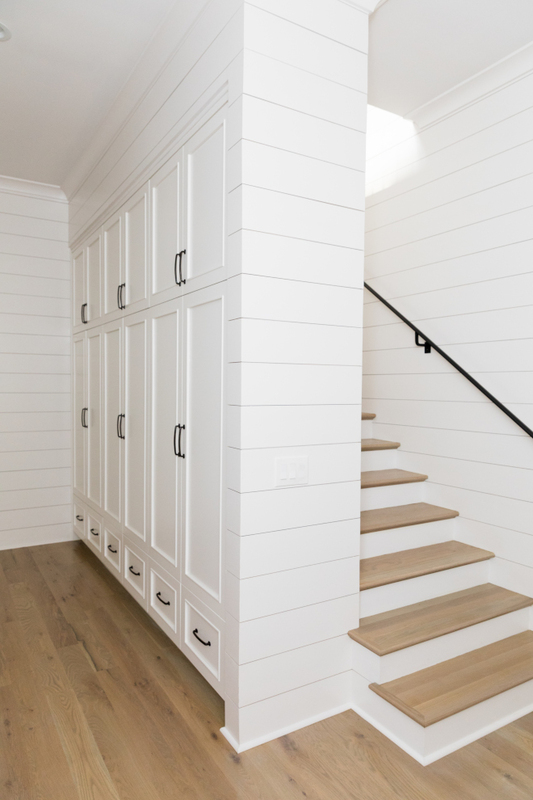 This mudroom is dreamy! 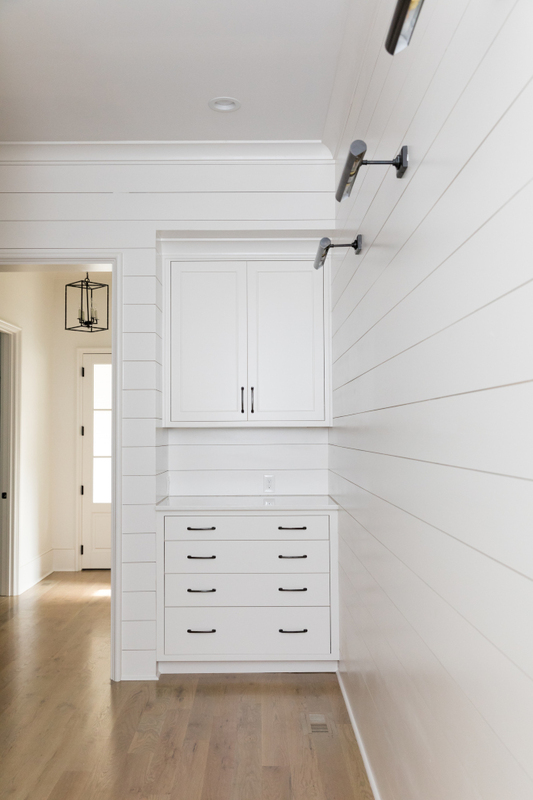 Walls are clad in shiplap and cabinets feature inset doors and drawers. Flooring is 5″ White Oak hardwood. 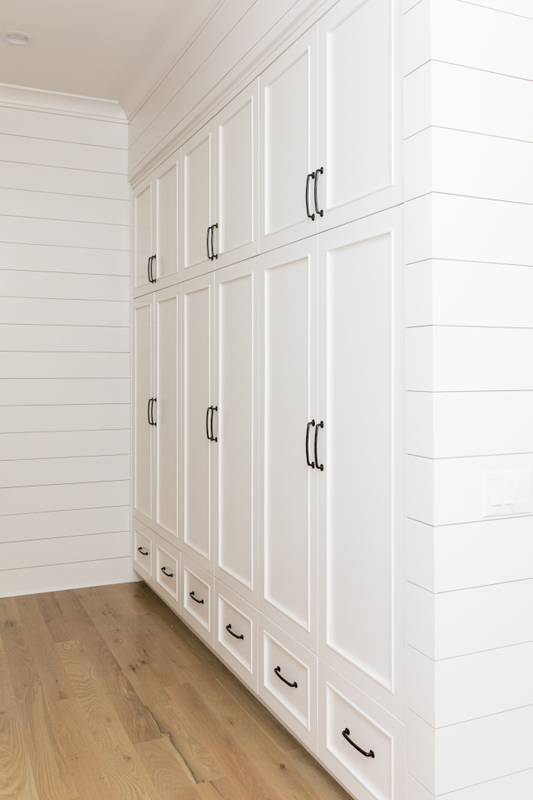 A “drop zone” featuring a custom cabinet with drawers and upper cabinets complete this mudroom. 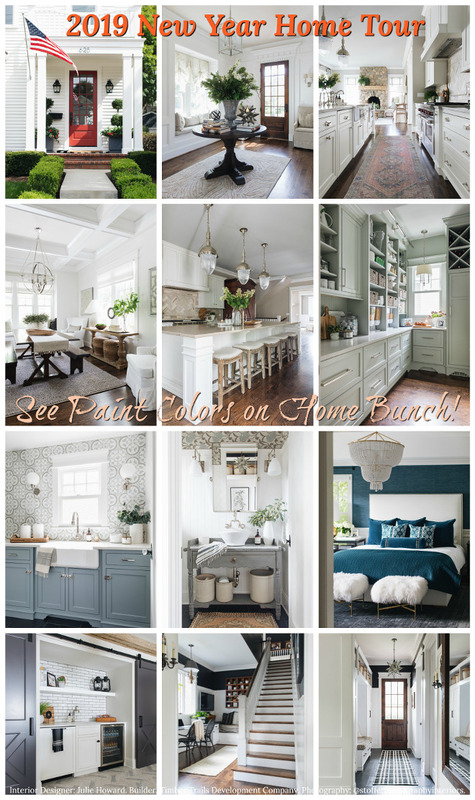 Paint color is Sherwin Williams Snowbound. This home keeps getting better, right? 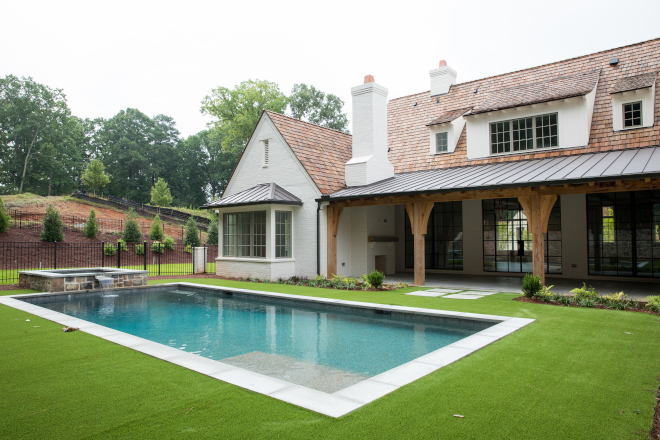 Who wouldn’t love having a backyard like this? 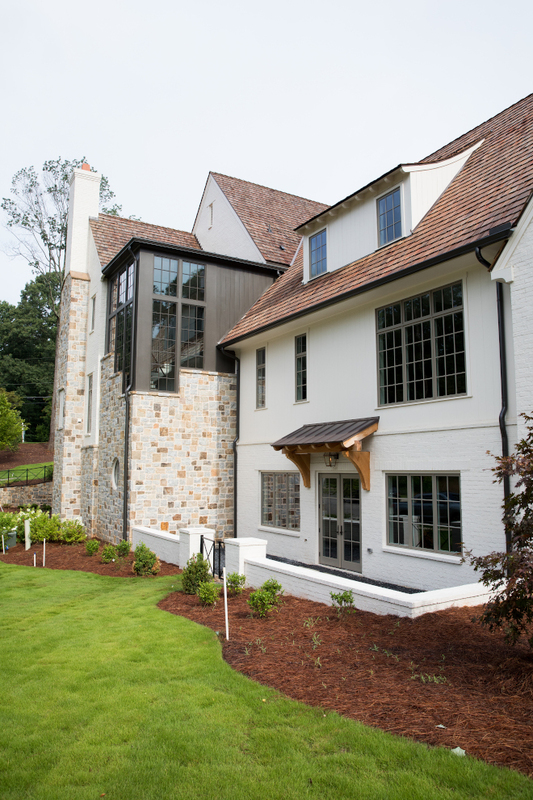 The back of the house features a large back porch with outdoor kitchen (on right) and outdoor fireplace (on left). The beam posts and brackets are Cedar. Also notice the black metal roof and doors. 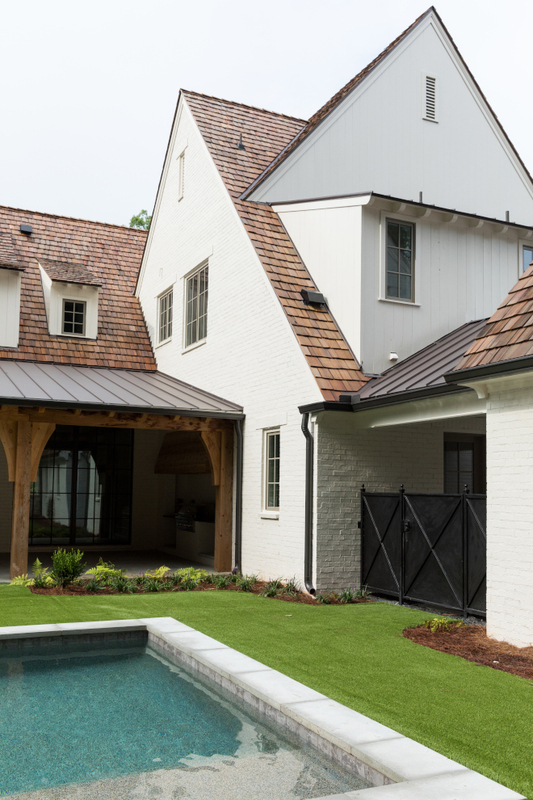 Roof: Cedar Shake with Antique Black metal roof. 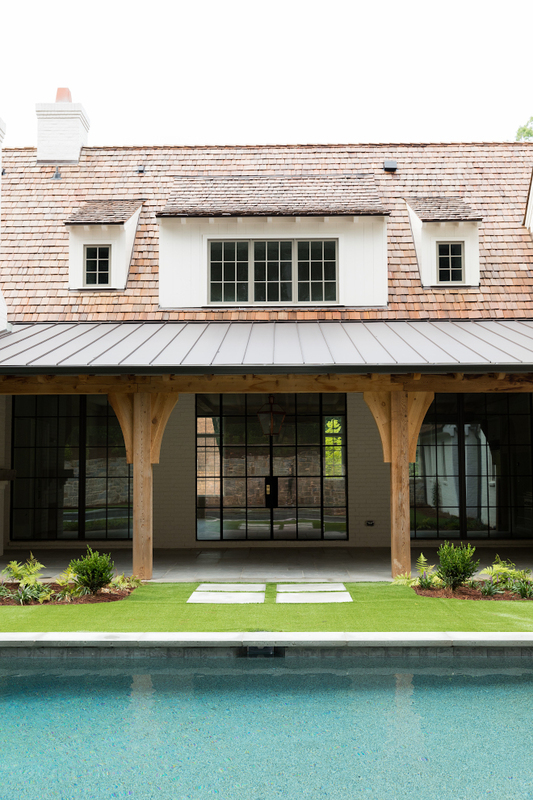 The side of the house features a private courtyard. The grey doors are painted in Sherwin Williams SW 7016 Mindful Gray. Gate: Custom iron gate with “X” detail. View of staircase tower from outside. Impressive!!! 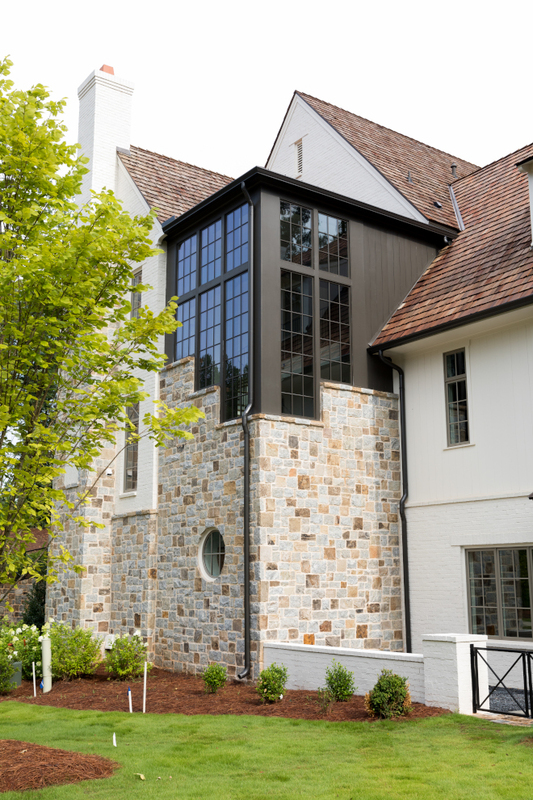 The exterior stone is “Weathered Granite”. Many thanks to the builder for sharing all of the details above. 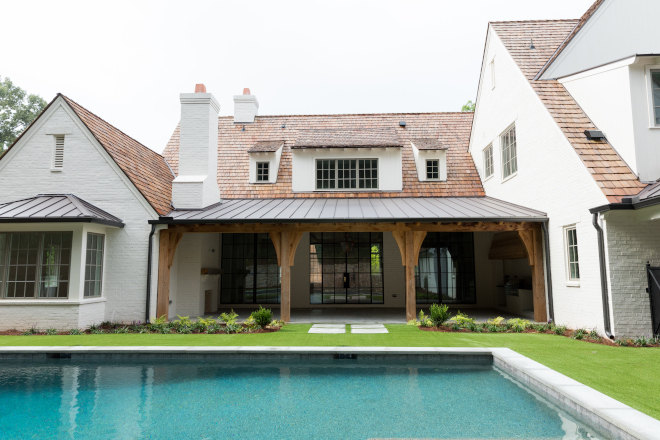 Project Manager: Justin Bell for TS Adams Studio Architects.